James Whitman is a troubled teen whose way of dealing with a dreadful home life isn't to head down some slippery slope of self-destruction, but to hug trees, find solace in the poetry of Walt (namesake) Whitman - and to get advice from his Inner Therapist, who happens to be...a bird. Dr. Bird, an invention born of James's angst, is a big part of what makes him such a lovable character. His first-person narrative is full of brilliant flashes of humor, which on the surface of it, soften the pain of his situation. I say "on the surface" because for me, the effect was actually to bring the coldness of James's home life into sharper relief, his intelligence and wit making him a more credible witness to it. He's not infallible (is any good protagonist? ), but he is sincere and believable. Kudos to author Evan Roskos for striking that balance. A few human relationships help James on his journey - one being with big sis Jorie, who's left home and school for reasons that don't become entirely clear till the final chapters. But James's biggest ally is his own determination to heal. He's a wonderful example for kids to find their own brand of quirky genius to help them through similar struggles. 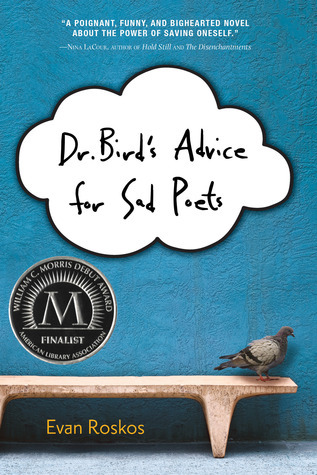 Sign into Goodreads to see if any of your friends have read Dr. Bird's Advice for Sad Poets.